The Dutch artist Simon Verelst was working in London by 1669 as a highly accomplished flower painter; Samuel Pepys was captivated when he saw ‘a little flower-pot […] the finest thing that ever, I think, I saw in the life’.Verelst also gained financial success as a portrait painter, with sitters mainly from the court circle, including both Charles II and James II, and the king’s mistresses, Louise de Kéroualle (1649–1734; RCIN 402652) and Nell Gwyn (c.1651–87; National Portrait Gallery). Perhaps Verelst’s most distinctive portrait is that of Mary of Modena when Duchess of York, which shows her wearing a richly embroidered riding habit depicted in meticulous detail. Presumably painted for either the Duchess or the Duke of York, that work was recorded in the collection of James II, hanging in Whitehall next to a companion portrait of James by Verelst, which is no longer in the Royal Collection. In the present portrait Charles II is portrayed wearing the sumptuous robes and insignia of the Order of the Garter. The Collar and Great George were those supplied to the king by the royal goldsmith, Robert Vyner, in 1661, although the Great George is shown erroneously in reverse. 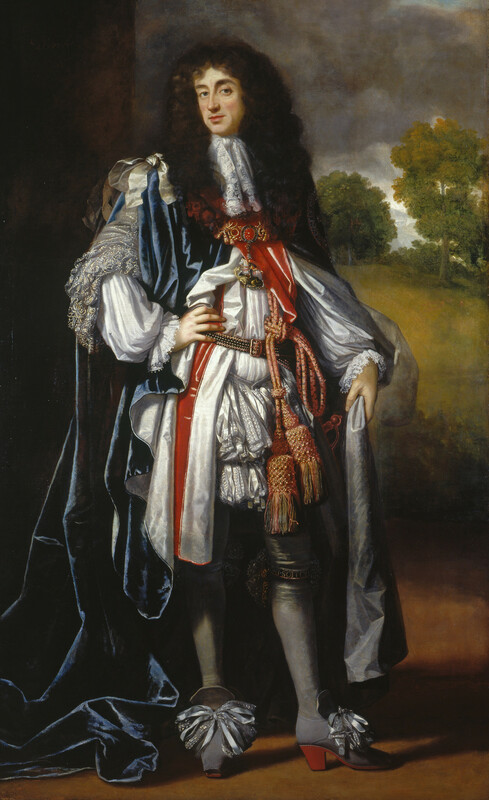 The king was painted many times in Garter robes and insignia, most notably by John Michael Wright. The celebration of the Order in painted form reached its apogee in Verrio’s frescoes in St George’s Hall, Windsor of 1682–4 , in which the emblems of the Garter proliferated. Text adapted from Charles II: Art anf Power, London, 2017.